I liked everything about Birthright. I liked the regency powers, realm magic, rules for domain management, ley lines, etc. Everything that is, but the boring as paste generic fantasy setting of Cerilia. If Birthright had been marketed and designed as realm domain rules for every campaign without being marketed as a setting, I think it would have done better. Interestingly, there was one Dragon article that tried to port those rules to Al Qadim, so you might be right. Birthright came at both the right and the wrong time... As (one of many) groups that had really started with 2nd edition we were all old hacks at the game when BR came out. That meant rotating DMs, high level characters and domain stuff from the word go. But it also meant college, military careers and all the real life stuff hit us before we really got going. And the setting support was never robust. Subscribed as well. Birthright and Planescape were the only two D&D setting I truly liked. Out of curiosity, does the pdf have a good scan of the map? It took me forever to hunt down a boxed set and it has most of the contents, including the cards, but the big, detailed map (that I'm assuming it came with) was gone, along with the cardboard chest for the cards. It did have a pamphlet about the dangers of witchcraft nestled between the books, though, which was a weird bonus. I ask mostly because I plan on buying a pdf when my budget allows, and the inclusion of a big map would help clinch my decision. Subscribed. Like Beckett, Dark Sun is my favorite campaign setting from the 2e era, but Birthright is a close second. I never really cared about the domain management stuff, but I always thought of it as generic fantasy done right. We open with a pair of Forewards, as was fairly typical of TSR products at the time, with the designers taking the time to explain how this thing came about and offer thanks to the Academy, as it were. The designers, in this case, are Richard Baker and Colin McComb. Richard Baker, of course, was one of the major designers at TSR at this point in time, having authored a number of adventures for almost all of the company's settings, and now getting the chance to bring his own setting to print, as Cerillia has parts of its origin in a novel he wrote after graduating from college. And Colin McComb is that jerk who wrote The Complete Book of Elves and didn't even have the decency to offer a sincere apology for it like he said he would. I kid because I respect. To make up for it, I'll let Mr. McComb have his say on the designers' intentions for Birthright. Emphasis is mine. people will fall into it easily. We wanted epic fantasy and in-depth role-playing. We wanted it all, in short, and I think the result is a pretty fair representation. Of course, there's stuff we couldn't put in here; that, I guess, is what the rest of the game line is for. We've tried hard to make the world as rich as possible in this box, and I believe you'll be pleasantly surprised. Did they succeed in that goal, or did they fail? We shall see. Next up is An Overview of Cerilia, an in-character dissertation about the setting from one of its major NPCs, Caliedhe Dosiere, the Chamberlain of Anuire, who writes for the edification of those who will follow him in that role, "stand[ing] watch over the empty Iron Throne, waiting for the day when the Emperor's line will return." And also for other regents who might hopefully learn something from his words. The in-character presentation is, again, fairly typical of TSR's product of the day, though thankfully not presented in slang derived from British thief's cant in this instance. In this first page of the book, we are introduced to a number of concepts. There was a battle, some sixty generations ago -- about 1500 years, based on statements elsewhere in the book -- at a place called Mount Deismaar, where the champions of good and evil fought, old gods died and new ones were born, and the world was forever reshaped. And "those who fought at the battle of Mount Deismaar and survived the destruction of the gods were imbued with a divine essence that they passed on to their descendants." This includes Caliedhe himself, and any of his descendants. And, by implication, your PCs. This is one of the reasons that I've developed a certain amount of ambiguity towards Birthright, as my tastes have changed and grown. Here we have a setting in which the ruling class is not only treated as better than those whom they rule, but have a qualitative way of demonstrating that, yes, they are better. However, there are some other twists on this that come later. We move from that Overview onto Caliedhe's History of Cerilia. In the beginning, the continent was the home of the elves and the dwarves. Despite what you're expecting, they didn't fight each other -- neither had time to do so, as they were preoccupied with armies of gnolls, goblins, orogs and trolls. No, that's not a misprint. There aren't any orcs in Cerilia, their role is more or less taken by orogs. In any event, this went on for who knows how long -- "the elves don't count the years as we do, and the dwarven calendars are indecipherable." Anything that the dwarves or elves built was torn down by the goblins or the orogs, and the armies of those goblins or orogs were annihilated by the elves or dwarves. The stalemate continued and it would likely have gone on forever until someone came along to change it. Enter humanity, pursued by a shadow. Five distinct tribes of humans fled into Cerilia from a land bridge on the southwest of the continent, trying to escape from the evil empire to the south and its predictably evil god, while a sixth came from the east on ships from across the Sea of Dragons. 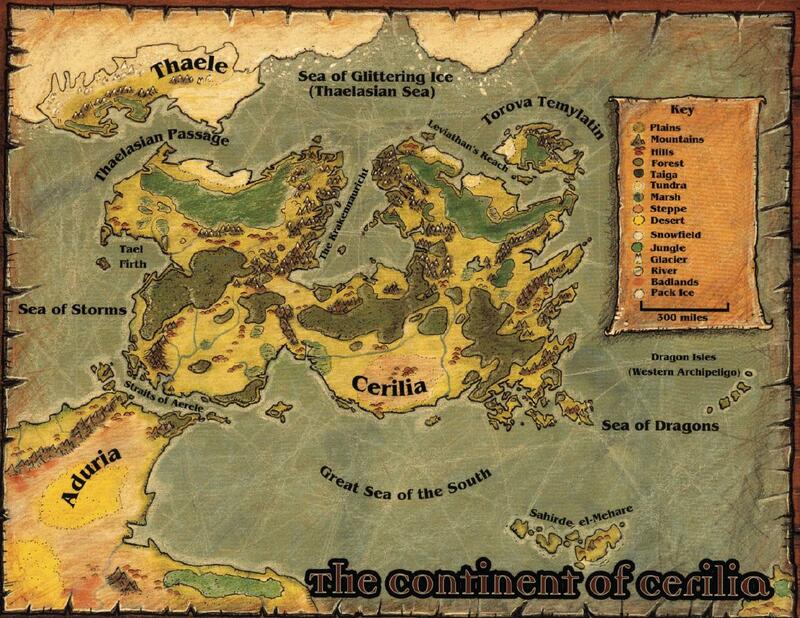 In the interest of clarity, have a map of Cerilia. Note that there's no land bridge in the southwest anymore. Remember that battle I mentioned? I wasn't being figurative when I said it reshaped the world. The Andu, or Anuireans, who worshiped the god of being a paladin, Andurias. The Rjuven, who worshiped the god of being a druid, Reynir. The Brechts, who worshiped the goddess of being a sharp trader, Brenna. The Vos, who worshiped the god of being a diviner or illusionist, Vorynn. The Masetians, who worshiped the goddess of the sea, Masela. The Basarji, the aforementioned easterners, who worshpped the goddess of the sun, Basaia, whose actual name I can't reproduce here without a lot of fiddling around with my keyboard that I just can't be having with. Suffice it to say there's supposed to be two jots over the i. And there was a seventh god, the lord of shadow, Azrai, who was being worshiped by the evil empires. There's a fair amount of confusion and ambiguity in the history -- it's not clear how the Basarji, who were from the Dragon Isles, shared a pantheon with the other tribes from Aduria. Nor does it go into detail about the "decadent southern empires". And the migration of the Adurians is covered very briefly but intriguingly in the following sentence: "The journey was arduous—many people fell to disease, goblin raids, natural hazards, and sometimes, stupidity." Not exactly a reverent myth, is it? Eventually, things settle down ... just in time for the Shadow which was pursuing the humans to finally arrive behind them. Out of curiosity, does the pdf have a good scan of the map? It does have a 32x21 inch map of continent and a more detailed one of Anuire, as well as the battle sheet for the wargame, packaged in the "Screen" pdf. It was easily my favourite TSR generic fantasy setting. It was more of a low-magic, you-can-smell-the-peasant-reek kind of setting, than Forgotten Realms. More like Game of Thrones, as it happens. That is kind of the point of the whole setting though - this is a world in which the Divine Right of Kings is in fact true. The rulers in this world are, in part, descended from the Gods. Yes, and I'm not wholly comfortable with my fantasies taking me to a place like that, since I'm a strong believer in liberty, fraternity, equality, all that cool stuff that people have bled and died to establish.